New format for this year! Unlimited qualifying on “classics” games only. The Museum of Pinball represents a unique opportunity for a tournament consisting of some of the greatest pinball machines ever made and games that are often not seen out on location or in tournaments. Come help us celebrate classic pinball and the skill in playing of some of the greatest pins history has to offer. Open qualifying from 11AM-5:30PM, plus 30 minutes from 5:30-6PM for scorekeepers only. Finals at 7PM sharp. $15 entry fee includes registration fee and 6 plays on the bank. Additional entries can be purchased for $2/ea or 6/$10 (cash only please). 100% of the entry fees will go back to the field in payouts, minus IFPA fees for tournament submission. (minimum of) 12 games in the tournament bank, 6 games count towards the qualifying score. Look for game announcements in the coming weeks. Thanks to Captain’s Auction Warehouse, we’ll once again have a $500 Captain’s gift certificate to the winner! Also, for the first time at ArcadeExpo, we will have IE Pinball streaming the tournament live on Twitch! 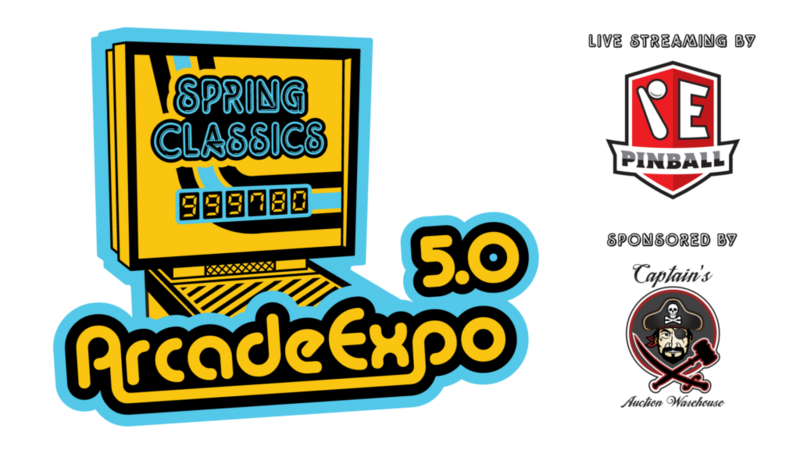 You will need a ticket for ArcadeExpo to participate in the tournament! Registration will take place at the tournament area on the morning of the event. Once registered, players may start playing immediately. If you’re planning on coming to the event, please consider volunteering to be a scorekeeper at the tournament. As compensation, scorekeepers will have their $15 entry fee waived or refunded upon completion of a shift, along with 6 plays on the bank. Additional shifts will be worth 6 additional plays. Please remember that this tournament is 100% volunteer run with no cash or other compensation provided, we really need your help! Sign-up for scorekeeping shifts here. The tournament will use the IFPA/PAPA ruleset for game issues and rulings. A full qualifying entry will consist of a players highest scores on 6 separate games. Finals are top 12 to A, next 8 to B. If less than 48 people participate, 8 to A and B. Finals format will be 3 games per round, 4,2,1,0 scoring. Games chosen by any player during the finals may only be chosen once per player. The #1 qualifier may choose to eliminate one game from the tournament bank for finals provided there are a minimum of 10 available/functional games in the tournament bank at the time of finals starting. Tournament will be capped at 120 players. Players ranked above 250 in the IFPA World Rankings (as of the day of the tournament) will be ineligible for B finals.